The use of Heat Recovery Steam Generators is mostly confined to the generating steam from the exhaust gases of a gas turbine. PES leave that application to power generation equipment suppliers. Our HRSG applications concentrate on recovering heat from process applications. The correct design of the equipment e.g. choosing between water tubed or fire tubed, selecting the correct heat transfer coefficient etc. Looking at the complete process to select the best operating pressure to recover as much energy as possible. Implementing a control system that eliminates interference with the process. PES has many years of experience designing systems on the demand side that allows us to optimize the design of the HRSG to the process. We also have innovative HRSG designs that allow provide the best solution for the application. We have numerous HRSG units in operation but each application is different and so there is no package solution. 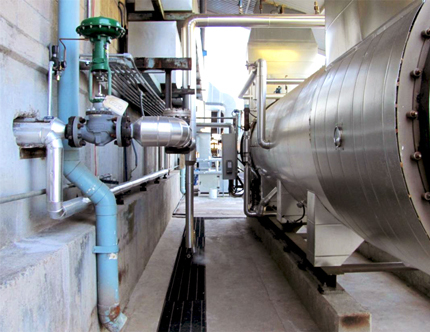 The key issue for a successful heat recovery project is to have little or no impact on the process and design a control system that has no requirement for operator input. A typical application is the generation of steam from the exhaust gases of a Yankee tissue machine. The gases typically leave the hood around 300°C (570°F) and although some of the energy can be recovered in combustion and make up air preheat there is still a considerable amount of energy lost. The installation of a HRSG allows a considerable amount of this heat to be recovered. The steam produced from the HRSG can be fed into the Yankee (high pressure application) or used elsewhere in the process (low pressure application). The lower the pressure of the steam generated the more heat can be recovered. All the PES HRSG are designed to ASME coding and we supply a complete package with the necessary ancillary equipment: safety valves, pumps, boiler controls, dampers and control system etc. The PES HRSG designs are based on tried and tested standard boiler design with the focus on long term reliability and low maintenance. Even for low pressure applications the boilers are rated for high pressure operation to give flexibility to change the application in the case of future process changes. The PES HRSG design is not limited to Yankee machines. It can be applied to many process applications such as industrial ovens or even high pressure boilers.